Cookie, waffle, chocolate and caramel in one luscious treat. Above, the Milk Cappuccino Dutch Moon stroopwafel cookie. Photography by Saidi Granados. Stroopwafels are an old Dutch treat, invented in the town of Gouda in 1784. The traditional way to eat them is with a cup of coffee, tea or cocoa. Just before it is eaten, the stroopwafel is placed on top of the hot cup in order to soften it up; the filling melts, and scents of cinnamon and nutmeg are released into the air. Originally a poor man’s treat made from crumbs, the cookies are ubiquitous in Holland, from inexpensive supermarket varieties to artisan-baked cookies. An American wife and Dutch husband have revived the artisan art in New Amsterdam, with delightful results: Chewy, chocolate-dipped Dutch caramel wafers, for small daily indulgences, guest treats and gifts. They are perfect with coffee and tea, and a novel gift for a host or hostess. We were sad when one of our favorite artisan producers in Massachusetts discontinued the delicious stroopwafel from its line. The complex yet homey cookies just weren’t moving as fast as other items, they said. We can only conclude that it’s because most Americans have never heard of a stroopwafel, and don’t know how good it is. Whether from a gourmet producer or the supermarket, it’s not easy to find a stroopwafel in this country. 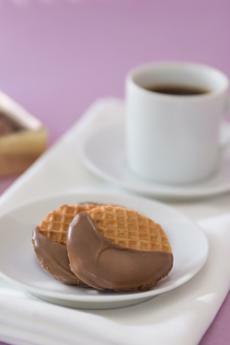 So we were thrilled when, at a recent restaurant trade show in New York City, we came across Dutch Moon Cookies. New Yorker Tracey Denton and her Dutch husband Eelco Keij, created this Dutch treat for Americans. Succulent and cinnamony, it’s a most delicious introduction to the stroopwafel. Read the full review on TheNibble.com.